O God, we long to know You and to love You, but the busyness of life often gets in the way. Help us to recognize the ordinary, daily ways that our family can learn about You and grow closer to You. We know that You are with us, leading us and guiding us on our way. Amen. This handbook is designed to familiarize families with the policies and procedures of St. Martha PREP/CCD Program. PREP (Parish Religious Education Program)/CCD (Confraternity of Christian Doctrine) is a program designed to assist parents in a more formal way to meet the religious education needs of their children in grades Pre-K–6 who do not attend a Catholic Elementary School. The pastor appoints a Coordinator who is responsible for the overall operation of PREP/CCD. Trained and screened volunteers act as Catechists, classroom assistants, safety monitors, and office assistants in the program. As classes begin at 8:15 AM on Sunday mornings, please plan on arriving 10 minutes prior to class. Children and their parents must enter the school through the church vestibule. Never enter the building through any other door. Please exercise extreme caution while driving or walking in the parking lot. Children are expected to be accompanied to and from school by a parent. Please do not park in the area used as a driveway, including the area near the school building. Dropping off children at the side door is not permitted. Children are to gather in the Chapel and will be escorted by their Catechist to their classroom. No child may be left in a classroom unattended. If the Catechist is late, please wait in the Chapel with your child until an adult is present to supervise the class. Parents are asked not to allow their child/ren to walk or ride a bike to and from PREP/CCD. Mid-year tests are given to students in Grades 1-6 in January. These tests are designed by the Catechists or the Catechist may choose to use those tests provided by the Office of Religious Education of the Archdiocese of Philadelphia. Children are verbally tested throughout the year for knowledge of prayers appropriate for each level of instruction. End of year tests are written in conformity with the Religion Guidelines of the Archdiocese of Philadelphia. They are administered to students in Grades 1–6 in May. 1st Semester Progress Reports are sent home in January and 2nd Semester/Final Reports in May for Levels Pre K-6. Your child is expected to be at CCD every Sunday and on time. 4 Absences: CCD Coordinator and parent/guardian will talk before the child can be admitted back into class. 6 Absences: CCD Coordinator and parent/guardian will meet in the Religious Education Office to discuss solutions to the absentee problem before the child can be admitted back into class. 8 Absences: CCD Coordinator will meet with the pastor and the child's teacher to discuss the possibility of having the child repeat the grade and/or (if a sacramental year) with holding the sacrament for another year. The CCD Coordinator will then contact the parent/guardian to discuss the decisions reached. Catechesis, according to the General Directory of Catechesis (GDC 29), is one of the most important ecclesial activities. The PREP/CCD program must reflect the broader meaning of the mission of the Church. The Catechism of the Catholic Church points out that the definitive aim of catechesis is to put people not only in touch, but also in communion with Jesus Christ (CCC 426). It is the responsibility of the Church community to respond to this in a fitting and satisfactory manner. Keeping in mind that all the baptized have a right to catechesis and that every person, however limited, is capable of growth in holiness (GDC 189), it is incumbent on the parish to invite, welcome and provide for those with physical, sensory, mental and behavioral disabilities (NDC 61:B.1). Present documents of the Church encourage, that, as far as possible, persons with disabilities should be integrated with the ordinary catechetical activities of the parish (NDC 49). It is the responsibility of the parish community to accommodate for individuals with disabilities by providing generous, competent and realistic programing, seeking dialogue with families, and proposing appropriate forms of education proportionate to the concrete possibilities and needs of the individuals. For individuals with disabilities, meaningful and appropriate integration will necessitate different forms of accommodation and varying forms of programing from full inclusion in the parish religious education classroom, to smaller group or individualized instruction (NDC 61:B.1). In order to provide this full inclusion, we ask that parents share with the CRE the nature of a child’s disability so we can make accommodations for that child in his/her learning and testing. We also ask that when registering or re-registering, the parent provide us with a copy of a child’s IEP from his/her public school. An IEP can help guide us in making accommodations for a child. The IEP will be shared with the child’s Catechist to insure we are working to accommodate a child’s needs. The IEP will be handled in a confidential manner by both the CRE and Catechist. Classes are held on Sunday mornings from 8:15 – 9:45AM in Saint Martha School, with Mass immediately following in the church at 10:00AM. Children are usually assigned to a level corresponding to their public school grade. However, if they have started late or have missed a year or more of religious instruction, they may be assigned to a more appropriate religious education level. E-mail - Parents are asked to keep us informed of your current e-mail address. This reduces our use of paper, ink and postage. If you do not have an e-mail account, please notify your child’s Catechist and we’ll send notices home with your child. Some items are illegal for minors to possess and some items are considered inappropriate for a Religious Education setting. Items such as weapons, alcohol, tobacco products, and drugs are illegal for minors to possess. Any student found to be in possession of such illegal material will be removed from class, have their parents notified, as well as notification of the appropriate authorities if deemed necessary. Some items such as, but not limited to, iPods, MP3 players, hand held video games are not necessary for class and should not be brought to class. A Catechist, assistant or the CCD Coordinator may confiscate these items if they are being used during PREP/CCD. They will be returned to the parent only. A child may bring a cell phone to class but it is to be silenced and kept in the child’s back pack or school bag. Anyone using a cell phone during class will have it confiscated and it will be returned only to a parent. PREP/CCD follows a curriculum for each level established by the Archdiocese of Philadelphia and stated in the Religion Guidelines of the Archdiocese and Scope and Sequence developed by the Office of Religious Education. You may read these documents online at http://phillyocf.org/prep-resources/. Text books are selected from a list of Archdiocesan approved texts that are found to be in conformance with the Catechism of the Catholic Church. Both written and study homework is usually assigned for each level. This gives the parents an opportunity to reinforce and expand upon concepts and doctrine being taught in class. Prayers are assigned for memorization at each level. Discipline should be fair and consistent. Classroom rules are introduced during the first class, posted each week, and reviewed regularly during the school year. Minor infractions are handled by the Catechist or assistant. Conduct by children, parents/guardians, or anyone acting on their behalf, incompatible with the educational and religious mission of the parish is grounds for disciplinary action, including, but not limited to the immediate dismissal of a student, as well as reporting the incident to the proper legal authorities. The CCD Coordinator will speak with the student and develop a behavior plan. The CCD Coordinator will notify the parents of the problem. The CCD Coordinator will meet with the parents and student. If no improvement the CCD Coordinator may recommend Home Study. A serious behavioral problem may be dealt with immediately and the CCD Coordinator may take appropriate actions including notifying the pastor. When classes are ended for the day the teacher will bring their class into the chapel. Parents/guardians may pick up their child in the chapel. Students will not be waiting in he hall and may not run to you when they come down stairs. You will pick them up IN the chapel. Please be aware of traffic and pedestrians and use caution in the parking lot. Students may not wait outside for their rides. If a parent is late picking up a child, we will wait with them until a parent or designated person arrives to take them home. However, if you arrive after 10 your child will be at Mass with his/her teacher. You will have to find them in church. If the teacher does not recognize the person picking up your child he/she will refuse to let the child leave with that person unless and until we reach you and you authorize it. I would suggest you send a note in with your child when you know you are not going to be the one picking them up on any given Sunday. 1. A written note must be handed to the Catechist by the child at the beginning of class. 2. We ask that you do not pick up a child before 9:15 AM. A child will not be considered to have attended a full class if he or she leaves before 9:15 AM. Sports practices or games are not considered an urgent reason for early dismissal; nor are they a legitimate reason for an absence. The CRE or Catechist will call attempt to call the Saturday prior to Sunday class if classes are to be closed due to inclement weather. Closings will also be posted on our PREP/CCD web site, which you can access from the Saint Martha Website. The direct PREP/CCD web address is: http://stmarthaprep.webs.com. We will also send an email notice whenever possible. Harassment, when one person repeatedly makes verbal, physical or electronic contacts with a person who does not want these contacts, by staff, volunteers and students will not be tolerated. Parents and children are expected to attend weekly Mass. A family Mass at 10:00 AM is provided for those attending PREP/CCD class. Weekly attendance at Mass is necessary for a child to receive sacraments.Your child will be given a box of envelops to put in the basket each week. This is one way we can track who is attending Mass faithfully. Attend Mass with your children every Sunday and Holy Day of Obligation. Send children to all classes on time and prepared to learn. Provide a school bag for your child’s books and regularly check the child’s school bag for assignments, notices and calendar updates after each session. Ensure that your child completes all homework and any missed assignments. Read all notices sent home from the Catechist or CRE. We do send some information by email, but other important notices are sent home with your child. Please check for notices each week. Help the child make up any work missed due to absence. Attend “Opening Day PREP/CCD Parents’ Meeting”. Attend all required sacrament preparation Evenings of Reflection. The Sacraments normally received during CCD are First Reconciliation (grade 2), First Holy Communion (grade 3) and Confirmation (grade 6). Children must receive the sacraments in their home parish. All three sacraments have an Evening of Reflection for parents/guardians. One or both parents/guardians must attend without their child. First Communion and Confirmation have a retreat day which the child must attend. The children are also presented at a 10:00 Mass prior to receiving the sacraments. A sign in sheet will be available for each. When we sin we sin against God and against our Christian community. The words of the prodigal son best express this when the son, upon his return, says to his father, 'I have sinned against you and against God.' We place ourselves outside of the community when we sin. In the confessional we hear the forgiving words of the priest letting us now that we are, again, in right relationship with God and we are also brought back into the community as the priest is representative of both God and the community. We, also, receive many graces when we take part in this sacrament. Our prayer for our children about to make their first Reconciliation is that they will experience the love and warmth of a forgiving God and will, thus, be inspired to continually take part in this wonderful sacrament. I recall the woman who was bleeding internally for years and thought 'If I but touch the hem of His cloak I will be healed.' And she did...and she was. How much more, then, should we who receive His Body and Blood be healed? We do more than touch the hem of His cloak. We receive the entire Body of the Lord. Jesus is really, truly, and substantially present in the Blessed Sacrament. Our prayer for our children about to receive Him for the first time is that they will be truly healed, that their eyes will be opened, and that they will recognize Him in the breaking of the bread. May they always remember that their most important reception of Holy Communion is the NEXT one. Promotion is based on consistent attendance and displaying knowledge of the Catholic faith appropriate for level. A student may not be promoted if he or she has unexcused absences and/or does not display sufficient knowledge of the faith. New registrations are accepted at any time. PREP families must be registered as parishioners of St. Martha Parish. Baptismal certificates, if not baptized at Saint Martha, must be presented at registration. Tuition and fees must accompany registration. Re-registration takes place in April for the following school year. Notices will be sent home with students enrolled in PREP/CCD. Tuition and fees should accompany the re-registration form. Sacramental preparation is a joint effort of the parish, parents, school and PREP/CCD. Families must be registered in St. Martha Parish. 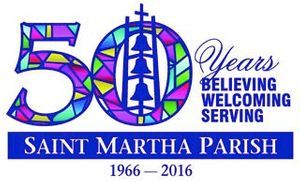 Families not registered at St. Martha Parish must have permission from the Pastor of their parish to enroll in St. Martha PREP. Enrollment in PREP/CCD or St. Martha School does not imply enrollment for a sacrament. Parents must complete and return a sacrament information form in order to enroll a child for a sacrament. A baptismal certificate must be presented and a copy must be on file in the Religious Education Office. St. Martha School’s Enrollment Office will furnish confirmation of the baptism of children enrolled in the parish school starting in first grade. The pastor or his designee will meet with any newly registered families or families already registered in the school, who have non-baptized or non-catechized children to determine a course of action for the reception of the sacraments. A fee is charged to cover the costs associated with preparing a child to receive a sacrament. Each fee and what it covers is published in the information parents receive to register their child for a particular sacrament. The Archdiocese of Philadelphia recommends a two-year formal preparation period for reception of a sacrament prior to the year of actual reception. At St. Martha Parish, children usually receive First Penance in the spring of second grade on a Saturday in Lent and First Communion in the spring of third grade at a Sunday Mass during Easter Season. The usual grade for the reception of the sacrament of Confirmation is sixth grade and celebrated at a Sunday Mass in the fall. An individual’s reception date for each sacrament may be changed for pastoral reasons. Parent attendance at Sacrament Preparation Meetings is an essential and required part of this program. The child’s attendance at the retreat is an essential part of preparation for reception of First Communion and Confirmation. First Communion and Confirmation, along with Baptism, are Sacraments of Initiation into the full sacramental life of the Church. Active participation in the Sunday Liturgy, the Mass, is an essential part of preparation for a sacrament and all students are expected to attend. If they do not, the administration of the sacrament will be delayed. The Religious Education Office will keep parents informed of meetings, practices, projects, dress codes, retreats and requirements for receiving a sacrament. Paperwork and fees have due dates. These due dates allow us sufficient time to verify information and print sacrament booklets and certificates. PLEASE OBSERVE OUR DUE DATES. Parents may opt out of these lessons for their child by contacting the CRE or Catechist in writing prior to the published date on which the lesson will be taught. Lessons are taught in the 2nd Semester of the school year. It is the policy of the Archdiocese of Philadelphia and Saint Martha Parish that all volunteers and staff are forbidden to use any form of corporal punishment. Please be aware of basic safety procedures in class and in other parts of the school, church and parking areas. Children should be supervised at all times. Children must be escorted by an adult when they are outside of the classroom. A fire drill will be conducted during the first month of class, weather permitting. Children will be made aware of the fire drill route for the classroom to which they have been assigned. During a fire drill, the children should leave silently and in a single file line and assemble in a pre-designated spot. In the event of another type of emergency please follow the directions given by the CRE or Catechists. It is the policy of Saint Martha PREP/CCD to respect the privacy of its participants. Unnecessary intrusions into persons and possessions are to be avoided. However, in the event that a student is suspected of having weapons or drugs in his/her possession, the CCD Coordinator will be immediately notified. The CCD Coordinator will conduct the search with an adult staff member as a witness. Refusal on the part of the student will result in parents/guardians being contacted and asked to assist with the search. Parental refusal will result in the student’s immediate dismissal from the program. Tuition covers the operating expenses of the PREP/CCD Program, including audio/visual materials, resource materials, Catechist and assistant training and other items purchased for use in the program. The tuition amount is set after consultation with the business manager and approval by the pastor. Tuition discounts are provided when families have more than one child attending Saint Martha’s PREP/CCD Program. A Textbook fee is also required for each PREP/CCD Student. During the course of the school year, if a book is lost, a replacement fee of $25.00 will be charged. An additional fee is also required for all children preparing to receive the Sacraments of First Holy Communion and Confirmation. This fee covers materials used especially for sacrament preparation including parent meeting speakers, retreats, practices, Confirmation robes, crafts, refreshments and DVDs of the Confirmation and First Holy Communion Celebrations. SCRIP credits may be used to pay tuition or fees. Any family experiencing financial difficulties/concerns should contact the CRE to discuss alternative arrangements. Financial difficulties should NOT prevent registration in the PREP/CCD Program. providing training to clergy, parish personnel, Catechists, teachers and volunteers regarding their responsibility, under civil law, as mandated reporters. This training also pertains to Archdiocesan personnel who are working in social services and educational ministry. All clearances must be updated every five years. It is the responsibility of the Parish Safe Environment Coordinator to keep the records of each employee and volunteer. Attendance at Safe Environment Training is expected within ninety days of the start of any new hire. Complete information on required background checks can be found on the Office for Child and Youth Protection webpage on the Archdiocese of Philadelphia website www.archphila.org. Volunteers must have all of the required background checks as they begin their service to children or receive provisional permission to volunteer as long as these forms are submitted within thirty days. During this provisional period, their service to children must be supervised. The Protecting God’s Children Program is a required awareness program for adults who are Church employees or volunteers of the Archdiocese of Philadelphia and who interact with children. Trainees learn the signs of child sexual abuse, the methods and means by which offenders commit abuse, and five empowerment steps to prevent or avoid sexual abuse. Training dates and locations are listed on the Office for Child and Youth Protection webpage on the Archdiocese of Philadelphia website www.archphila.org. The Office for Catechetical Formation and the Office of Child and Youth Protection recommend that these lessons are taught in the second semester after a relationship between the Catechist and students has been established. The Coordinator of Religious Education must obtain a written signed and dated opt out letter from the parent or guardian. These forms are to be submitted to the Office for Children and Youth with the annual parish audit report. describing the circumstances and conditions that obligate mandated reporters to report known or suspected child abuse. providing definitions for juvenile/family courts when to take custody of the child. specifying the forms of maltreatment that are criminally punishable.